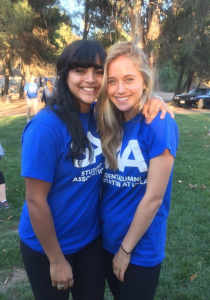 As I sit on a stiff dorm bed in the middle of the sprawling UCLA campus, my heart fills with gratitude, as my host Valerie shares her life journey with me. She recounts the hardships of an alcoholic mother, life moving through different orphanages, and finally the hope of a new life. Valerie and me on the UCLA campus. I am in my junior year of high school, a nuisance to my parents, a detriment to myself, but luckily a source of comedy for my friends. I am taking some interesting classes, one of them a history class about current events. We are focusing on immigration and the attack of an elderly man by an immigrant and the complicated court procedures that follow. This leaves a gray image of immigrants in my mind. I had recently decided that I am going to pursue cross country athletics at the college level. I am excited, nervous and anxious to be on my first official visit to the University of California, Los Angeles. Before my official visit, I am told that I will be given a host while I am there who will be my go-to person if I have questions. I will also be staying on an air mattress in the host’s dorm room. I am not sure I am prepared for that level of intimacy. As I depart my plane at LAX, thoughts and images of my host, Valerie, race through my head. Will she be nice? Will she be okay with me sleeping two feet away from her? But, most of all, will she like me? These nervous, annoying questions keep popping up in my head the entire walk from plane to curbside, waiting for the car, my host and an illustrious coach to pick me up. The moment I am greeted with a huge smile and a quick hand wave from Valerie, my fears are allayed. We drive quickly, for LA traffic, to the quaint, smaller than imagined campus that is home to 50,000 Bruins. My nervous, sometimes annoying tendency to over-question people begins in the car and continues in the small, crammed, stuffy dorm room that Valerie and I will share for the weekend. Our conversation about Valerie’s heritage begins after I hear a slight hint of an accent, sounding vaguely Eastern European. Valerie is astonished that I can tell, and it prompts her to tell me of her time growing up in the chaotic atmosphere of a small town in Ukraine. Valerie speaks about the hard times she and her sister encountered before she was adopted, and in many ways rescued, by a California woman. Valerie elaborates on the difficulty of the language barrier in middle school, a time when making friends is hard enough, and being the new, foreign girl makes it even harder. As the story continues, Valerie turns to the opportunities America has given her. She tells me about how she excelled in high school, which in turn gave her the liberty of choosing from some of the top universities in the nation. She led a number of student groups and was captain of her cross country team. Valerie is truly chasing the American dream, and about to catch it. Her story of hope and resilience sticks with me throughout the weekend. This is the first time I’d heard the terms immigrant and America used together in a positive light.